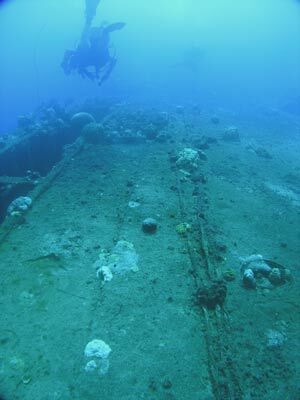 Michael McFadyen's Scuba Diving - Rio de Janeiro Maru On 16 May 1929 the keel of the Rio de Janeiro Maru was laid done by by Mitsubishi Zosen Kaisha Ltd at Nagasaki in Japan for Osaka Syosen KK. On 19 November 1929 she was launched and completed on 15 May 1930. She had four sisterships built from 1925 to 1929. The Rio was 140 metres (461.2 feet) long, with a width of 18.9 metres (62.0 feet)and a gross tonnage of 9,627 tons. Powered by two six cylinder Mitsubishi Sulzer diesel engines of 7,515hp each, the ship was capable of 17.6 knots. The Rio de Janeiro Maru was a pasenger/cargo vessel (total of 1,140 passengers) built for use on the Japan, Hong Kong, Singapore, South Africa, South America, Panama canal, US West Coast and back to Japan run. On 1 June 1930 she left her home port of Kobe on her maiden voyage South America. In April 1934 the Rio de Janeiro Maru ran aground in the Mississippi River estuary. During January 1937 to December 1938 (at least) the ship's route was Kobe, Yokkaichi, Yokohama, Kobe (2nd call), Hong Kong, Singapore, Colombo, Durban, Cape Town, Rio de Janeiro, Santos, Montevideo, Buenos Aires. The homeward voyage was via Santos, Rio de Janeiro, Belem, Cristobal, Balboa, Los Angeles and Yokohama to Kobe. On 8 October 1940 the Rio de Janeiro Maru was requisitioned by the Imperial Japanese Navy and on 19 October 1940 she began conversion to an auxiliary transport at the Kure Navy Yard. On 1 November 1940 she was commissioned as an auxiliary transport (Unsosen) in the Sasebo Naval District. The conversion was completed on 30 November 1940. This included the installation of two 25-mm Type 96 dual AA guns, signal equipment and new accommodation spaces. On 24 February 1941 she departed Sasebo for the South China coast. On 3 March 1941 she arrived at Keelung, Formosa (now Taiwan). On 25 March 1941 the Rio de Janeiro Maru's status was changed to an auxiliary submarine depot ship (Sensuibokan) in the Sasebo Naval District. At Harima's shipyard in Banshu, Hyogo, another conversion starts. Four 5.9-inch (150-mm) guns and a range finder are fitted. A torpedo and depth charge hangar is constructed as are replenishment goods storage and a medical facility. Motor launch loading equipment is also installed. On 7 May 1941 this conversion is completed. On 24 November 1941 the Rio de Janeiro Maru was at Sasebo. She is a tender in Rear Admiral, the Marquis, Daigo Tadashige's SubRon 5 with light cruiser IJNS Yura (F), SubDiv 28 (I-59, I-60), SubDiv 29 (I-62, I-64) and SubDiv 30 (I-65, I-66). The same day she departed Sasebo for Palau with Yura and SubDivs 29 and 30. Enroute, SubRon 5 is diverted to Samah, Hainan Island, China. On 8 December 1941 as part of Operation "E"- The Invasion of Malaya - the Rio de Janeiro Maru arrived at Camranh Bay, Indochina (now Vietnam). The same day, Japanese forces landed on the Kra Isthmus of Thailand and north east Malaya. On 8 January 1942 she departed Camranh Bay and on 10 January 1942 she arrived at Singora, Malaya. Here she disembarks personnel and equipment of the 11th Submarine Base Unit. From here she went to Kota Bharu, Malaya, then Brunei, Borneo. On 2 April 1942 she arrived back at her home base at Sasebo. On 10 April 1942 she became part of SubRon 5 with SubDiv 19 (I-56, I-57, I-58) and SubDiv 30 (I-64, I-65, I-66). SubDiv 28 was deactivated and I-59 was added to Sub Div 19 and I-62 was added to Sub Div 30. 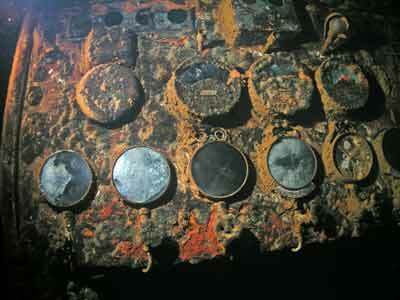 Sometime in 1942 at Kure, seven coils were fitted all around the ship's hull for magnetic mine degaussing. On 7 May 1942 Captain-Retired Ohashi Tatsuo (40) assumed command of the Rio de Janeiro Maru. 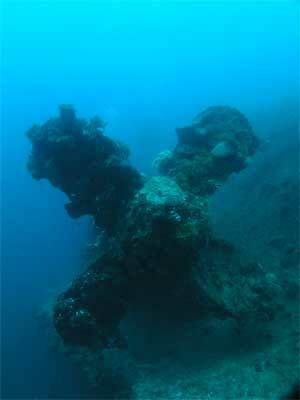 On 14 May 1942 the Rio de Janeiro Maru is part of Operation �MI� - The Battle of Midway. She was assigned to Vice Admiral, the Marquis, Komatsu Teruhisa�s Advance (Submarine) Force�s (Sixth Fleet). ON this day she departed Sasebo for the Dutch East Indies (now Indonesia). 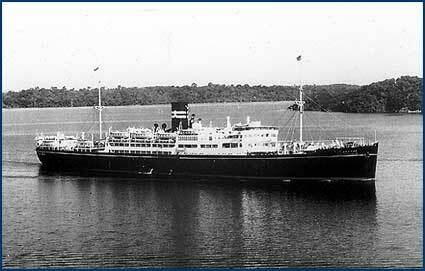 On 29 May 1942 the Rio de Janeiro Maru was travelling through Balbac Strait, north of Borneo in the convoy. Lieutenant Commander Chester C. Smith in the USS Swordfish (SS-193) operating from Fremantle, Australia, was patrolling the Strait. The submarine�s lookouts spot a small convoy and Smith sets up for a submerged night attack. Smith fires two Mark 14 steam torpedoes at a vessel he identifies as a �5,000-ton� oiler. Smith claims no hits, but one of his torpedoes does hit the Rio de Janeiro Maru and rips open a 46-foot long by 26-foot wide hole in Hold No. 1. Note that at least one US submarine researcher expresses doubt about the USS Swordfish attack. Smith then fired another two torpedoes and sinks cargo ship Tatsufuku Maru. After the attack, six sailors on the Rio de Janeiro Maru volunteered to enter her flooded compartment and seal the leak. For their actions they received a commendation from Admiral Yamamoto Isoroku, CINC, Combined Fleet. The repair ships Asahi Maru (a small one and not the hospital ship at Truk in February 1944) Sahi Maru and Yamabiko Maru arrived later and towed the Rio de Janeiro Maru to Singapore for repairs. During June 1942 the Rio de Janeiro Maru was in Singapore where she was drydocked and repaired at Seletar's No. 1 Shipyard (former King George V Graving Dock). 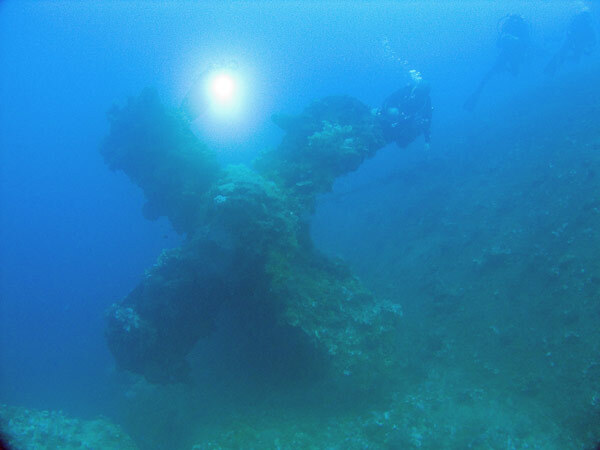 On 6 June 1942 the Rio de Janeiro Maru (together with the Shinkoku Maru - also a Chuuk Lagoon wreck) was one of the support vessels for the Japanese submarine fleet involved in the Battle of Midway (note that there appears to be some date conflicts here). On 2 July 1942 after the repairs are complete she arrived back at her home base at Sasebo. On 10 July 1942 SubRon 5 was disbanded and on 14 July 1942 she was reassigned to Vice Admiral Takahashi Ibo's Southwest Area Fleet as a tender for flagship I-8 and SubDiv 30 (I-162, I-165, I-166). On 21 July 1942 they departed Sasebo. On 27 July 1942 when 94 miles east of Camranh, Indochina, (11.28°N 110.52°E) the Rio de Janeiro Maru was attacked by USS Spearfish (SS-190). Her skipper, Lieutenant Commander James C. Dempsey later claimed two hits of four torpedoes he fired in a submerged night attack. He departed thinking the stopped ship is sinking by the stern. The next day, Captain Ohashi reported that the Rio de Janeiro Maru suffered "medium" damage, but he was able to proceed to Hong Kong for repairs. On 3 August 1942 she arrived at Camranh Bay. On 27 August 1942 she replenished SubDiv 30. For the next month her whereabouts are unknown. On 6 October 1942 Sub Ron 5 was deactivated. 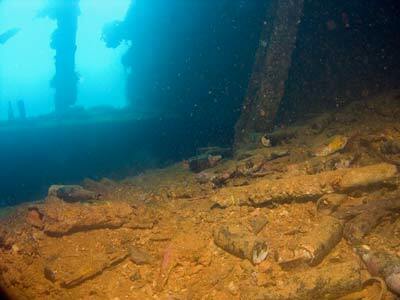 Rio de Janeiro Maru remains with Southwest Area Fleet. Her activities for the rest of the year are not known. On 1 January 1943 the Rio de Janeiro Maru was at Surabaya, Java (now Indonesia). She continued her service as a tender in the Southwest Area Fleet's SubDiv 30 (1-162, 1-165, 1-166). She seems to have stayed in this area for at least the next month as on 25 January 1943 she was employed transporting air field construction materials to Kokas on the Bay of Sekar, West Java. On 2 February 1943 the Rio de Janeiro Maru was at Ambon, Moluccas (now called Maluku Islands, Indonesia) when she was attacked unsuccessfully by aircraft. On 16 March 1943 she was assigned to the Second Southern Expeditionary Fleet of the Southwest Area Fleet. Again, her whereabouts for the next six weeks are unknown but presumably she stayed in the Indies as on 1 May 1943 she departed Java for Ambon carrying 200 Allied POWs. The next two months are unaccounted for and on 2 July 1943 the Rio de Janeiro Maru loaded drums and cargo for Balikpapan, Borneo (now part of Indonesia - presumably this was somewhere in Japan). There is also a mention that she was scheduled to carry 5,000 drums of AvGas to Yokosuka. Balikpapan oil refinery is located on the shore of Balikpapan Bay. It was established in 1922 and is the oldest refinery in the area. It was obviously in operation at this time but later it was destroyed by the Allies (re-built in 1950). On 16 July 1943 she departed Balikpapan and on 23 July 1943 she was at Sorong, Vogelkop Peninsula, New Guinea. She arrived back in Balikpapan on 27 July 1943. It seems that she was now doing a fuel run taking fuel from the refinery to the war front. On 1 August 1943 she departed Balikpapan and on 3 August 1943 arrived at Surabaya. The next three weeks are not known but on 23 August 1943 the Rio de Janeiro Maru arrived at Ambon. From here she went to Surabaya, Java, arriving on 29 August 1943. She left the next day and on 31 August 1943 arrived at Tarakan (this is also on Borneo). On 3 September 1943 she arrived at Davao, Philippines. On 15 September 1943 she arriveg at Manila. The same day, Captain Ohashi is designated the Supervisor of Modification. 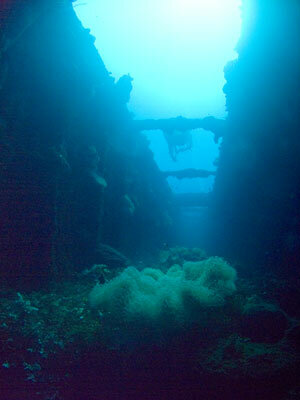 The Rio de Janeiro Maru is demilitarised and rerated a civilian transport in the Sasebo Naval District. She then departed Manila for Balikpapan. After presumably doing another fuel run, on 2 October 1943 the Rio de Janeiro Maru left Makassar, Celebes for Batavia (now called Jakarta - Capital of Indonesia) carrying 200 Allied POWs. She arrived at Batavia on 4 October 1943. On 11 October 1943 she departed Surabaya escorted by minesweeper W-8 until the following day. It is not know where she went but on 22 October 1943 she again departed Surabaya with fleet oiler IJNS Kamoi escorted by minesweeper W-8 as far as the Banka Straits. At 1600 on 25 October 1943 she arrived off Horsburgh Light near Singapore. On 24 November 1943 the Rio de Janeiro Maru departed Sasebo and on 26 November 1943 arrived at Kure. She left here on 29 November 1943 and the next day arrived at Osaka. On 5 December 1943 recalled Captain-Retired Kanemasu Yoshio is posted as Supervisor of Modification. Captain Ohashi is reassigned to the Kure Naval District. On 14 December 1943 she left Osaka and the same day arrived at the Aioi Shipyard. Here she began been modified. It is not know exactly what was done, but it was possibly installation of Type 96 25-mm AA machine guns and search radar as carried out at Aioi on other sub tenders. On 13 January 1944 the modifications are completed and she left Aioi at 7 am for Miike. Captain Kanemasu is the Commanding Officer. On 18 January 1944 she arrived at the Kure Naval Arsenal. Here she loads thousands of rounds of various sizes of ammunition destined for light cruiser IJNS Agano which is at Truk undergoing repairs by repair ship IJNS Akashi. On 23 January 1944 the Rio de Janeiro Maru departed Kure and arrived at Kobe. On 27 January 1944 she left Kobe and on 29 January 1944 she arrived at Yokosuka. Here a load of depth charges, coastal defense guns, foodstuffs and mail for transport is taken on board. On 3 February 1944 the Rio de Janeiro Maru departed Yokosuka (and Japan) for the last time. She was escorted by IJNS Yuzuki. On 11 February 1944 she arrived at Truk. On 17 February 1944 the Rio de Janeiro Maru was anchored east of Uman Island. The ship was hit by 1,000-lb. bombs during TF 58's first attacks, probably dropped by SBDs of USS Yorktown (CV-10) and SB2Cs of USS Bunker Hill (CV-17). Captain Kanemasu was killed in action and later promoted to Rear Admiral, posthumously. 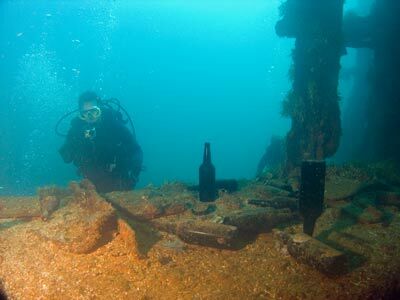 At 12.30 am on 18 February 1944 the Rio de Janeiro Maru sank. On 31 March 1944 she was removed from the Navy List. 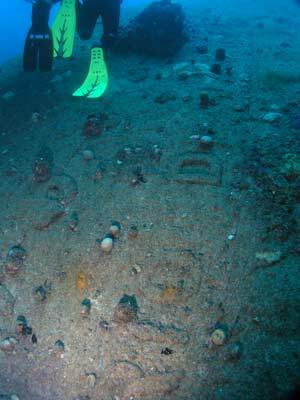 Today, the Rio de Janeiro Maru sits at a maximum depth of about 34 metres, with the ship lying on its starboard side (note that at least one of the books on the Chuuk Lagoon wrecks says it is on its starboard side but then has diagrams showing her on the port side). It is located on the eastern side of Uman Island, perhaps a few hundred metres off the southern most end. A GPS Reading of N7° 18' 15.8" E151° 53' 40.8" using WGS84 as the datum will put you on the bridge. Dive boats generally anchor on the bridge area or near the bow. 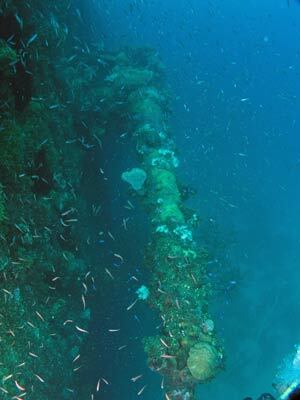 As you swim down onto the wreck it is quickly obvious that this is a huge wreck, the fourth biggest in Chuuk Lagoon in terms of tonnage. 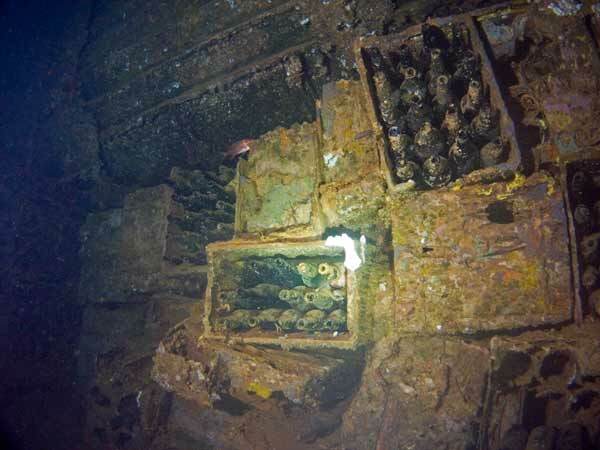 One of the first things you see is the degaussing coils which were installed when she was taken over by the Navy. These coils, huge steel cables which are wrapped around the ship's hull just below (I think) the waterline, were an important part of any ship used in a theatre of war. A brief explanation of their use is in a separate article. 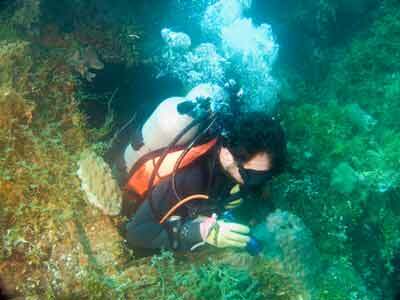 The huge expanse of the port hull (10 metres) is covered in small patches of hard and soft corals. 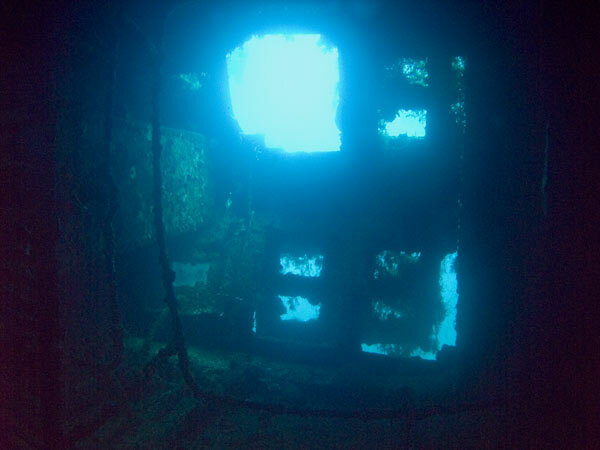 The growth is not as prolific as other wrecks in Chuuk. The name of the ship can just be made out on the hull side at the bow. 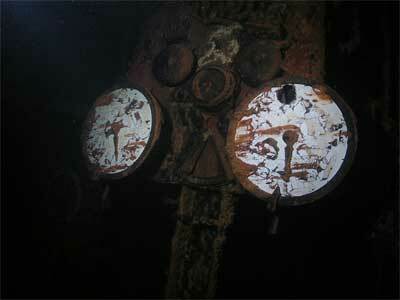 There are numerous portholes, mostly still in place. 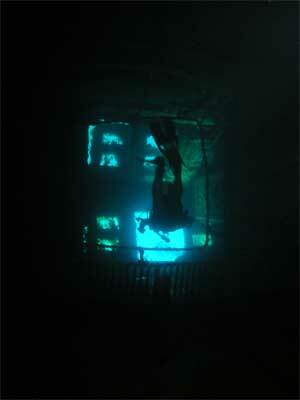 After reaching the ship, a dive can begin by dropping over the side and moving towards the bow of the ship. From the bow you see the anchor chain running out to the anchor which apparently lies about 50 metres in front of the wreck. There is a large gun mounted on the bow forecastle and there is considerable damage which confirms that ammunition exploded inside the ship and blew holes in the hull as it went up. On the top of the hull at the bow it looks as though a giant has repeatedly punched the inside of the hull. The plates are bubbled everywhere and there are also a large number of holes where shells exploded from inside Hold 1 to the outside. After entering the hold you can see that another large explosion occurred in the front hold causing considerable damage to the 'tween decks, the starboard hull and other bits of the vessel. Some remains of the artillery shells which caused the explosion can be seen. You can exit out the starboard side and swim under the ship back to the area of the masts and kingposts. Hold 2 contains two large gun barrels and a couple of cylindrical shaped objects, probably gun turrets and other parts of large guns. There is also a huge amount of coal and lots of bags of cement in here. Behind the second hold is the bridge. I have not closely examined it but it is said to be quite interesting. Behind the bridge is Hold 3. I am not sure what is in this hold. Behind this is the engine room. This can be accessed via the skylights. You will straight away see ladders and gangways. Keep going in and you will see off to your left the two engines, both consisting of 2 x 3 cylinders. Deeper in you will see rows and rows of gauges, valves and on your left, the remains of the two engine room telegraphs (above right). When back outside, you will see the funnel and that there is more damage behind the funnel on the starboard (bottom) hull from a direct American hit. This is probably the hit that caused the ship to sink. 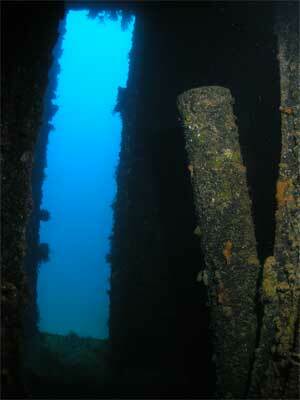 As you swim aft you can go under the two masts (there are no kingposts). Behind the very extensive superstructure (which contained the passenger parts of the ship) is Hold 4. This contains another gun base which lies from the lower section of the hold over the 'tween deck and almost reaches outside. There is even more coal in this hold but there does not appear to be a gun barrel to go with the base (of course it may be under the coal). You can swim into Hold 5 via the 'tween deck. The rear hold has thousands of beer bottles. The bottles are packed in 20s in wooden boxes deep inside the hold. Many have spilled out of the boxes (and therefore the deeper part of the hold) onto the 'tween deck. There is also a lot of timber, perhaps these are the remains of bottle crates. As is the norm, there is another large gun on the stern and some shells. Under the stern the single rudder and the large twin four-bladed props are clearly visible. The depth on the shallowest prop is about 24 metres. 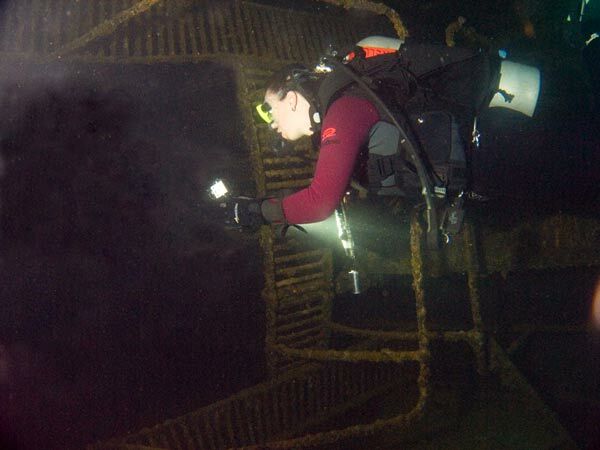 This is a wreck which needs many dives to fully appreciate it. I would recommend a minimum of two dives here if you get the chance.